Please receive my blessings. All glories to Srila Prabhupada. Sripada Madhavendra Puri is the greatest jewel of our parampara. He was the one who brought back Radha Krishna prema-bhakti in this world after it had been hidden away. Madhavendra Puri was the disciple of Laksmipati Tirtha, who was initiated by Vyasatirtha. Nityananda Prabhu was also initiated by Laksmipati Tirtha, although some authorities held that Nityananda was a disciple of Madhavendra Puri. Srila Prabhupada admits both the possibilities (Caitanya Caritamrita Madhyalila 3.8.128). After finding la Srimurti of Gopala in Govardhana, the Lord appeared in a dream and asked him to bring sandalwood from the Malaya region to cool Him down, as He was feeling very hot. Madhavendra Puri begun his journey feeling great ecstasy. 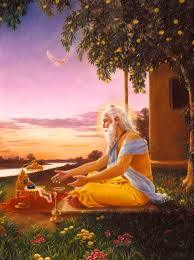 He took the route through Bengal and went to Santipura, where Advaita Acarya resided. Seeing in Madhavendra Puri the highest synptoms of ecstasy, Sri Advaita asked to be initiated by him. After initiation, Madhavendra Puri spent a few days with Sri Advaita discussing Krishna katha. It is said that the two great personalities associated more even after Sri Madhavendra continued the travel.